SPRAL and the friends of SPRAL having a potluck dinner party at Michelle’s! It was more than delicious, with food from homemade cheese, to gluten free pie, to clam chowder, to pulled pork. Nick wins the award for furthest commute time to the party! 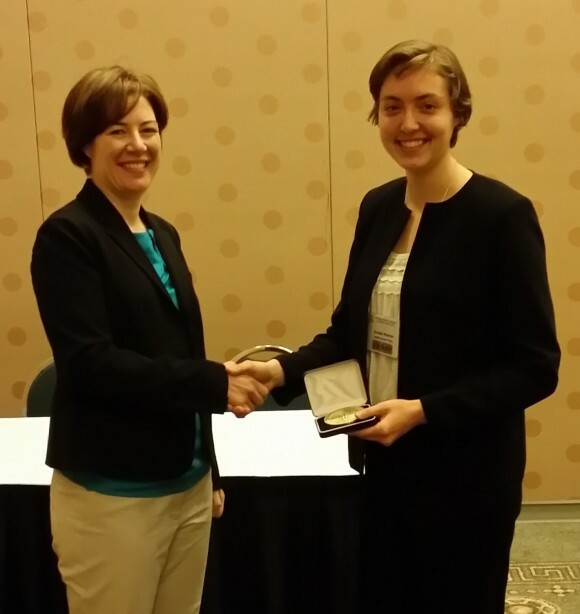 Acadia Kocher Receives Newman Medal! Way to go Acadia, and congratulations! SPRAL welcomes its first two NSF REUs, Acadia Kocher & Matthew Neal, for Summer 2013! Acadia Kocher (Physics at Northwestern University) and Matthew Neal (Arch. Eng. at Penn State) were selected for NSF-sponsored Research Experience for Undergraduates (REU) position for the summer. Both Acadia and Matthew will be working with Dr. Vigeant on her NSF CAREER award project to study concert hall acoustics. Welcome Matthew and Acadia! Welcome to the new SPRAL news page. Hi and welcome to the new SPRAL News Page! Here is where we will post the latest happenings of the Sound Perception and Room Acoustics Laboratory here in the Graduate Program in Acoustics at Penn State. Stay tuned!